‘Spruce’ was donated by the South Staffordshire Water Works Company. were in service at Hopwas Pumping Station near Tamworth from 1879 until 1962 when they were replaced by electric pumps. Naming engines was a very common practice. These two engines were named after two local dignitaries: a Mr Spruce and a Dr Woody. to prevent any accidental contamination of the adjacent production well. One engine, ‘Woody’ was returned to the city of its origin and has been rebuilt at Snibston Discovery Park, Leicester. It was thought best that as many people as possible should enjoy and experience the engines running. As a result of this policy, Forncett received ‘Spruce’. ‘Spruce’ was constructed to a design which was applied to a large number of engines. This design was in use throughout industry for the remarkably long period of 150 years. The main parts of the engine – cylinders, columns, main bearings and bell cranks to work the valve gear – were all located from two independent cast-iron floor beams. The entablature girder on which the beam trunnion blocks sat was attached to the two columns. The girder was also attached to the masonry of the engine house wall on both sides and at each end giving the engine the name ‘House Built’. 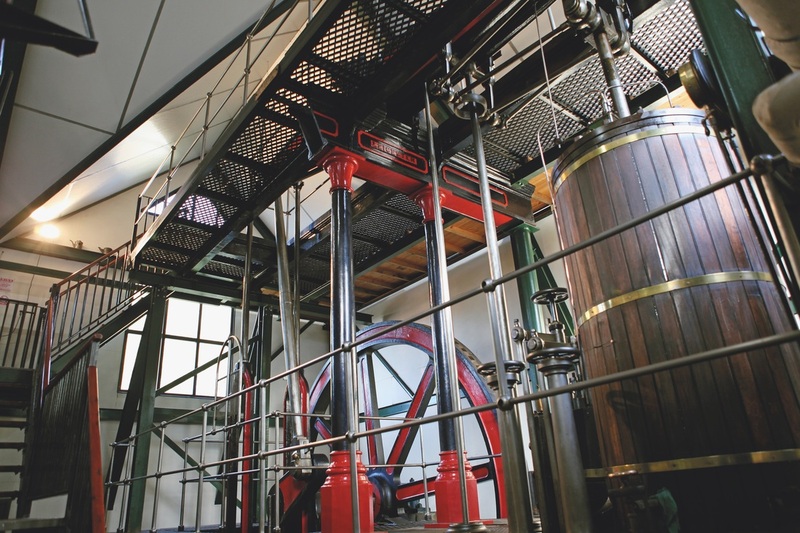 The engine has fine proportions and is decorated in the style which was universal throughout the water industry. A style designed to reinforce the water industry’s pride in its industrial importance. The well pumps were driven by pitch pine shafts attached to the flywheel end of the beam by two elaborate cast yokes. They raised water 260 feet at the rate of 0.5 million gallons a day. by teams from Forncett and Leicester Museum with the help of the Staffordshire Water Works Company. The Engine has now been rebuilt in a new engine house and can be seen running on ‘Steam Up’ days. DONATED BY The South Staffordshire Water Works Company. TYPE Single Cylinder House Built Rotative Beam Engine. 50 HP. BUILDER Gimson & Co., Leicester. 1879. CYLINDER 26 inch X 60 inch Stroke. VALVES Meyer expansion slide valves. BEAM Twin plate cast iron. FLYWHEEL 14 foot diameter. Cast in four quarters. CONDENSER Jet type spraying into exhaust pipe. AIR PUMP Direct rod drive from beam.